One of the ways we practice wise retirement stewardship is by making good use of the tax-advantaged savings plans at our disposal. Tax-deferral is a gift of God’s common grace that we can all take advantage of here in the U.S. (Psalm 145:9). As our savings earn interest and dividends and increase in value, we get to keep the taxes, at least temporarily and sometimes indefinitely, which helps our savings to continue to grow even more. Then, depending on the type of account, we only have to pay taxes on the money we withdraw (or none at all in the case of a Roth account – an exception is that your heirs will have to pay taxes later on). A great way to take advantage of tax-deferral is to save in your company’s defined contribution retirement plan, such as a 401/k, 403/b, etc. You probably did that before contributing to an Individual Retirement Account (IRA) – or “arrangement” as they are technically referred to by the IRS. That especially makes sense when you receive an employer matching contribution (rule #1: if you’re offered “free money,” take it!). Once you did that, if you wanted to save more, you may have started contributing to an IRA. In an earlier article, I presented a suggested approach for allocating your retirement savings between your employer plan and your IRA based on a 15% saving level. IRAs are simply a way to save for retirement outside your company-sponsored plan that provides certain tax advantages. Those benefits depend on your situation and the type of IRA you have. IRAs come in different flavors. There are Traditional IRAs, Roth IRAs, SIMPLE IRAs (a misnomer if ever there was one), and SEP IRAs. They differ mainly in how they are established and their respective tax treatments. Traditional and Roth IRAs are set up by individuals, whereas SEP and SIMPLE IRAs are established by self-employed individuals and small business owners. From a taxation standpoint, in most cases, Traditional IRA contributions are “before tax,” and therefore tax deductible, whereas Roth IRA contributions are “after tax,” so they are non-tax-deductible. There are some caveats to the deductibility of Traditional IRA contributions based on whether you have a retirement plan through your work and also your income level. Income tax filing status (single or married/joint) plays a part too. You can get more information on all of that from the IRS here. Both Traditional and Roth IRAs grow tax-free, but one of their big differences (and arguably, the most significant) is how you are taxed when you withdraw from them in retirement. After age 59 ½, withdrawals from Traditional IRAs are taxed as regular income, but funds can be withdrawn from Roth IRAs tax-free. If you are contributing to an IRA, the “before-tax” benefits of Traditional IRAs (and 401Ks) will be less if you are in a lower tax bracket under the new law. Does that mean that you should stop and start contributing to a Roth IRA instead? Probably not, especially if you receive an employer matching contribution in your 401/k. If you are in withdrawal mode in retirement, the new law may mean that will pay less tax on withdrawals from Traditional IRA or 401/k accounts. Because of the favorable tax treatment of Roth IRAs over long periods of time, I would recommend that younger people use Roth accounts since it is highly likely that their tax bracket will higher – perhaps much higher – many decades down the road when they are in retirement. Roth IRA rules also allow a penalty-free withdrawal if used for the purchase of a first house. I have most of my assets in a Traditional IRA because there were no Roth 401/Ks or Roth IRAs during the first half of my working life (it was introduced in 1997) and they had more stringent income restrictions than they do now. Although my savings continue to grow tax-free, I will have to pay regular income taxes on any withdrawals I make in retirement (ouch!). We all have to “render to Caesar” sooner or later (Mark 12:17). Because I am subject to income taxes when I withdraw from my Traditional IRA, I have previously entertained the idea of doing a “Roth Conversion.” Conversion is something that the IRS allows whereby you can magically change a Traditional IRA to a Roth IRA if you meet certain conditions, not the least of which is having to pay all the taxes due on the converted amount in the year the conversion is done. Also, once you convert, you have to wait five years before you can start withdrawing from it. Before 2010, only people who earned less than $100,000/year could do a Roth Conversion, but that has changed and now everyone can. Once you convert, your account has all the benefits of a Roth IRA, subject to the restrictions I cited above. Roth IRAs are highly touted for their tax-free characteristics. However, the decision to do a Roth conversion is by no means a “no-brainer.” That’s because of the taxes you have to pay at conversion to save on taxes in the long term. As you know, I try to maintain simplicity in my financial world so complex conversions aren’t very exciting. Plus, the idea of handing the government a pile of money now versus later doesn’t sit well with me either. But because the taxes associated with doing a Roth conversion may be the lowest I will see for the rest of my life, I wanted to take another look. The simplest way to think of this is that the higher the tax bracket you are in retirement relative to your saving years, the more valuable a Roth is to you. The problem, of course, is that none of us can predict the future, so we don’t know what our tax bracket will be in 10 or 20 years. Taxes are a big factor in retirement planning, but this uncertainty makes planning difficult at best. If your tax rate goes down in retirement, a Traditional IRA looks better. If your tax rate goes up, then the Roth may be best in the long run. Even if rates do go up, your income in retirement could be lower so the impact may be negligible. Because taxes are so low now, relatively speaking, and our government debt and spending needs are so great, I think the most likely scenario is higher rates in the future. So, as you will see, when I reran the numbers for a Roth conversion I made that assumption. 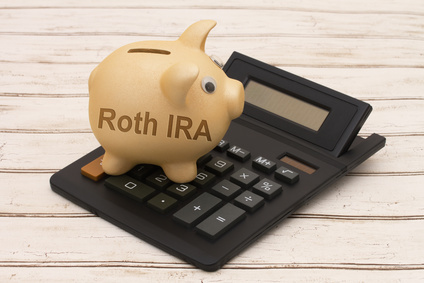 One of the significant challenges with Roth conversions is that you have to come up with the taxes on the converted amount and if at all possible you DON’T want to use money from your IRA for that purpose. That means if you have a $50,000 tax bill, you will need to have it sitting in a non-retirement account somewhere. If you use your IRA funds, you will reduce the size of your account that needs to continue to grow and then generate income in retirement. My Traditional IRA is in a self-directed brokerage account with Fidelity Investments. However, Fidelity doesn’t have a Roth Conversion Calculator, so I used the one on the Schwab website. There may be better ones out there, but I trust companies like Schwab, Fidelity, and Vanguard to be reasonably accurate. I also ran it on the CalcXML site; they are also known for high fidelity calculations. The scenario I ran was to convert 50% of my funds in a single year so that I would be 50% Traditional and 50% Roth going into retirement. Since I was only looking at converting a total one-half of my IRA funds, I set the first withdrawal out 15 years (well beyond the five-year requirement). Generally speaking, the longer the time before you start withdrawals from a converted account, the more beneficial the conversion will be. That also gave the money time to grow at the “moderately conservative” rate of 4.5%, which was also an option setting in the tool. The Schwab tool makes the assumption that I will pay the taxes out of non-IRA assets, which tends to favor the Roth option. The CalcXML tool allows you to specify where the money to pay the taxes will come from, so if you intend to use a portion of your IRA for the taxes, the CalcXML may be a better tool to use. I also ran the numbers with a lower estimated future tax rate of 20% to see what impact it had. Finally, I ran a scenario where I would convert 10% of my assets a year for five years rather than doing a 50% “big bang” conversion. I didn’t even consider converting 100% in year one as I know that would never fly due to the extremely high tax bill and the fact that I would have to leave the money alone for at least five years. The calculators worked great coming up with a quick and straightforward answer. The first thing I found was that my tax bill would be more than what I have sitting in any non-retirement savings accounts. That was a red flag for me right off the bat. If I pay the conversion tax from a non-IRA account, the results would be better. Next, for the 50% conversion in a single year scenario, retaining the Traditional IRA was the better option. I think that was mainly because of the high tax bill in the conversion year despite the lower current tax rate. The Traditional IRA would have looked even better if the calculation assumed that I was going to use IRA funds to pay the taxes as those funds would not be able to continue to grow in the Roth IRA. Finally, despite the significant tax bracket differential between now and 15 years from now, I found the 10% per year for five years scenario a breakeven one. Even if the margin of error for the calculator is 2 to 3%, I still didn’t have a compelling case to do a Roth Conversion. Even if the analysis showed a slight advantage to doing it above a reasonable margin of error, I still might not do it just because I don’t want to bother with it. I always feel uneasy about using a tool that requires me to predict anything in the future (in this case, future tax brackets and investment returns). Handing many thousands of dollars to the government in extra taxes today for the possibility of having a little more when I am in my 80s or 90s, assuming a bunch of other things come true, is not my idea of a wise decision. “Better is the sight of the eyes than the wandering of the appetite,” (Ecc.6:9a – ESV) could be liberally paraphrased as, “A bird in the hand is better than two in the bush.” The Bible warns us repeatedly about presuming on the future (Prov.27:1), but we sometimes do need to make reasonable assumptions about what could happen as part of a rational decision-making process. Roth conversions may be very advantageous for some people. The younger you are, the more likely it will make sense for you. If you do the conversion incrementally over a few years to minimize taxes and pay them with non-IRA funds, your numbers will look even better. Also, waiting longer to start withdrawals from the converted assets will give the Roth more time to grow will favor that option. So, although my results weren’t compelling, that doesn’t mean you shouldn’t run the numbers for yourself. I will probably run them again when I am retired and have a better handle on my taxes at that time. But your situation may be much different than mine. RMDs and Roth conversions each present complex scenarios for analysis, so simple calculations like this don’t always do them justice. You should decide if you think you might be a candidate for conversion. If so, run the numbers and then, if you think it might be worthwhile meet with a financial advisor or tax professional who is an expert in this area who will do a comprehensive and detailed analysis for a one-time fee. If you get serious about doing a conversion, you need to do your homework and get professional help. Especially because under the new tax law you can no longer “re-characterize” a Roth IRA, meaning once you do it it’s done – you can’t revert to a Traditional IRA and avoid paying the taxes.